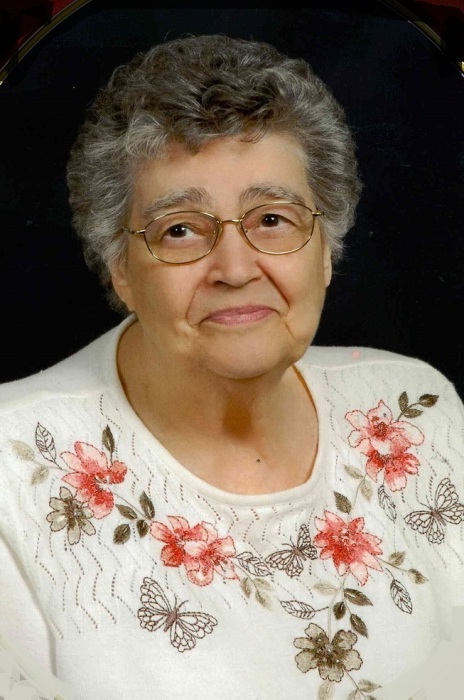 Mary Ellen Hoagland, 89, of Peru, passed away at 9:00 AM, on Thursday, March 8, 2018 at her residence. Mary was born in Peru, on May 6, 1928, the daughter of Orlie P. and Fern Griswold Black. Mary went to school in Peru and married her husband Raymond A. Hoagland, Sr. on February 18, 1947 at the St. Charles Catholic Church in Peru. Raymond preceded her in death on April 20, 2009. Mary was a homemaker, a devoted Catholic and spent 1978 to 1988 working at the Ben Franklin store here in Peru where she was fondly known as “Mother Mary” to everyone. She was a member of the Altar & Rosary Society, Daughters of Isabella where she served as Regent for the Daughters of Isabella for 6 years and was a Charter Member of the St. Charles Mothers Club. Surviving are her sons Raymond A. Hoagland, Jr. and his wife Dawn of Peru, James B. Hoagland and his wife Diane of Kokomo; daughters Cynthia Montgomery and her husband Frank of Bloomfield, IN, Anita Bitner and her husband Jeff of Mexico, IN. Theresa Webb of Peru, , IN, Dorothy Wormuth and her husband Russell of Chili, IN, Rita Clingaman and her husband Mike of Peru, Cathy Smith and her husband Eric of Denver, IN and Patricia Chambers and her husband Mark of Peru, IN; brother Jerry Black and his wife Glenda of FL; sisters Marjorie Edwards of Mesa, AZ, Patty McIntosh of Kalamazoo, MI and Nancy Norris and her husband Dennis of Twelve Mile, IN; a sister in law Betty Black of Kokomo; 32 grandchildren and 33 great grandchildren. Mary was preceded in death by her parents, her husband Raymond Sr.; daughters Carol Hoagland, and Mary Frances Gros, brothers John Black and Carl Black; sisters Rosetta Burns and Ruth Grady; and 3 great grandchildren. A Mass of Christian Burial celebrating the life of Mary Ellen Hoagland, will be held at 11:00 AM, Wednesday, March 14, 2018, at the St. Charles Catholic Church, 58 W. 5th Street, Peru, IN with Father Adam Mauman officiating. Burial will be at the Mt. Hope Cemetery. Family and friends will gather Tuesday, March 13, 2018 from 2:00PM – 8:00 PM at the Eikenberry-Eddy Funeral Home, 84 W. Main Street, Peru, IN. A prayer service will be held at 8:00 PM at the funeral home. In lieu of flowers memorial donations may be made through the Eikenberry-Eddy Funeral Home to Miami County Helping Hands or St. Vincent DePaul.